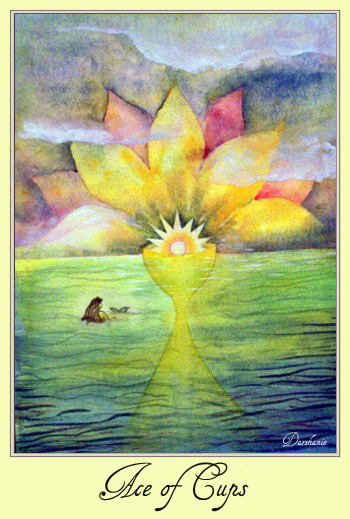 The Ace of Cups starts the suit of water which deals with emotions, love and intuition. This is a very important suite because we live on a planet and in a body that is mostly water. Our main themes are rooted in this element. The ocean is the womb of life, our ancient origins. Our genetic history originated in the ocean before finding its way to land. The ocean is a vast realm, fluid and deep, ever changing and ever shifting. As humans we find safety in the solidity of the earth, afraid of the raw power from which we came. But the ocean is not only in the Atlantic or Pacific, it within us, in our subconscious. Within that realm are stored our feelings and traumas of previous lives, our anger, our shame , our fears and despair. It is the realm of the Swadisthana Chakra. It is there below the surface and it communicates itself to us through our dreams, urges, sexuality and addictions. Indeed it is our Pandora’s box, a realm that holds all that is terrifying but at the same time it carries the raw stuff which as we transform, allows us to become aware, compassionate and loving Beings. As humans we are evolving. We have a history or many lifetimes from which we have collected many traumas and have them stored deep in our subconscious. When we allow these impressions to bubble up, at their right time in divine order, allow them surface and give them their space to express, incredible release takes place and we begin the spiritual work of letting light in and healing. This is the beauty of this card. Here we have a single cup which reaches down to the depths of the ocean, way into the subconscious realm and funnels up some feeling yet unnamed and gives it expression. The time is the early morning at sunrise where the dimensions open for a few moments; where impressions can rise up from the deeper layers without much distortion. A mermaid oversees this event. She is a being of the depths and she understands how to deal with processes of this nature. She is able to allow this event to take place and it does, liberating what was once in darkness, bringing it into light, giving it a chance to transform, and initiating a step towards love. 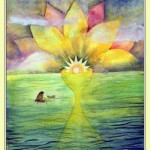 This entry was posted in Cups, Tarot on January 26, 2014 by darshanie.